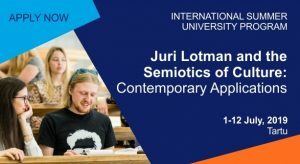 The aim of the course is to give an introduction to Lotman’s semiotic theory of culture, its theoretical background and context as well as new developments and applications of his theory in current semiotics and cultural sciences. More specific aim is to offer deeper understanding of cultural mechanisms and a set of tools for practical analysis of culture – cultural texts as well as cultural processes – that would afford new insights into contemporary cultural dynamics. compare different sign systems and analyse the processes of translation between them.